Compared are the cut US-BD by Full Moon and the uncut German DVD by '84 Entertainment. When the car breaks down, five adolescents end up at Slausen's Oasis, some kind of wax museum in the middle of nowhere. Owner Slausen offers to help the adolescents to help with the car but they die at the hands of a mysterious masked killer, just one after another. 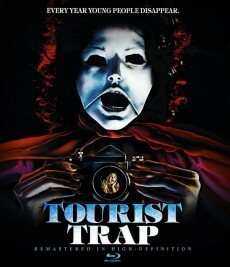 Over the years, Tourist Trap has gained a little cult status due to Chuck Connor's performance as psychopath with supernatural powers and some nicely done jump scares. The anticipation was huge when the new US Blu-ray had been announced. The original 35mm negative served as source material. And in fact, the image quality is quite terrific - much better than the previous release. Unfortunately, the US Blu-ray contains a shorter cut of the movie. The violent scenes remain untouched but some plot elements have been removed. Even producer Charles Band can't explain why that is. Maybe, a shorter version had been edited for the theatrical release back in the day. The German DVD and the US Blu-ray are running with the same amount of frames per second. But interestingly enough, the Blu-ray runs with more frames per seconds after the 65th minute. 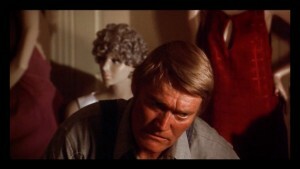 Becky notices that the lights are on at the neighbor's house and suggests to go over there in order to look for Eileen. Molly says she stayed where she was and she didn't want to participate in the search. Another cut to the three prisoners. 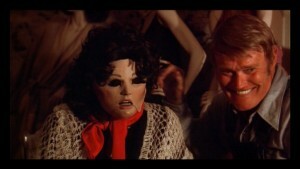 Then Molly walking aroudn in the room until she approaches the doll of Slausen's wife. Now Molly walking around the room in the US Blu-ray version. The DVD Version shows Molly looking out of the window instead. When the phone starts ringing, she picks it up but there is no one at the other end of the line. That is when she realizes that the cable has been cut. She grabs a flashlight and leaves the house. When she has left, the light of the doll is being switched on. The US Blu-ray shows Molly waking up. A woman is with her and passes her something to drink. Molly asks the woman to let her go but the woman doesn't respond. The DVD on the other hand shows Molly tied to a bed when she wakes up. She unsuccessfully tries to free herself until Slausen shows up with the doll in a wheelchair. He threatens to make a doll out of her as well. Molly asks him to let her go but Slausen explains he couldn't do it. Furthermore, the following scene contains two additional shots of Becky and Jerry. Now the scene with Molly and the woman in the DVD Version (already took place on the US Blu-ray, please see the previous cut). Slausen knells down to Molly and asks if he could kiss her. Then he says she would follow the others. In the end, he hears Jerry rattling at the door.